And so it was that I stupidly entered. I regretted it the second later. 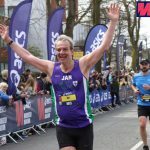 Anyhow, I had the ‘Bob’ to train for and recover from after, so this was a race that gave me nightmares, which strangely excited me and one that I’d rather not face. I was honestly planning NOT to be on the start line. A little more coercion from Stuart and I was out recceing the route. It’s fine, it was just a training run…one that we’d managed well, taking time to map read and successfully navigate until the last 4-miles, when somehow we’d convinced each other that the compass and map, and all logic, was illogical…but then after 30mins of studying the map and the clearly visible landscape, we’d followed the compass and found our way home. This worried me enormously but yet again a week later I was out at 8:30 pm on that same hill in the dark with Stuart, Sam and Kim ‘mastering’ the last section so I’d be fine come race day. We’d ‘aced’ it, returning to the car at 2 am to return home and collapse on the sofa only to be woken again at 7 am by the kids prodding me! This running through bogs in the middle of the night lark sure beat my student partying days! I invested in new kit, good, warm kit. I spread all of my kit options out on the bedroom floor and weighed each piece then decided between items to pack. My kit bag, come race day, needed more than the minimum. I get cold quickly and, if I were to get injured in this race, I’d need them until I was found… which potentially could be a long time. I got a few messages, most implying I shouldn’t race. 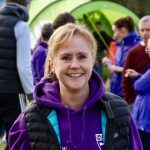 The thought of challenging myself trumped the fear and that strange and wonderful excited/nervous/incredibly excited feeling returned that I hadn’t felt since the Bob. • Will I die in the dark in Hedgehope bog after my head torch has packed in? (spare head torch battery packed, portable battery charger packed, extra head torch packed with extra batteries!). And so it was, my bag was packed, picnic packed, waterproof map packed and cut to size (200g saved! ), drop bag packed with a change of clothes, trainers, extra food and drink. The downside of all this packing, for every eventuality, meant that my bag weighed a tonne. Friday night I moved out to the spare room and set my alarm for 3 am, Stuart was to pick me up at 3:45, registration was until 5:30 am. Game time, 6 am. We travelled up listening to motivation clips. Stuart was on an incredible high; he kept repeating ‘Game Time’ in a crazily giddy way. It cheered me up immensely. We registered in the village hall, my beautifully packed clothes had to be unpacked and checked prior to getting my number. I started to panic, I always do. I look around and convince myself I don’t belong, that all these fit runners will see through my facade and laugh that I’d even attempt it. Stuart said my nervousness reminded him of me pacing around the Moot Hall before the Bob. ‘Game Time’ he kept repeating until it rung in my head. 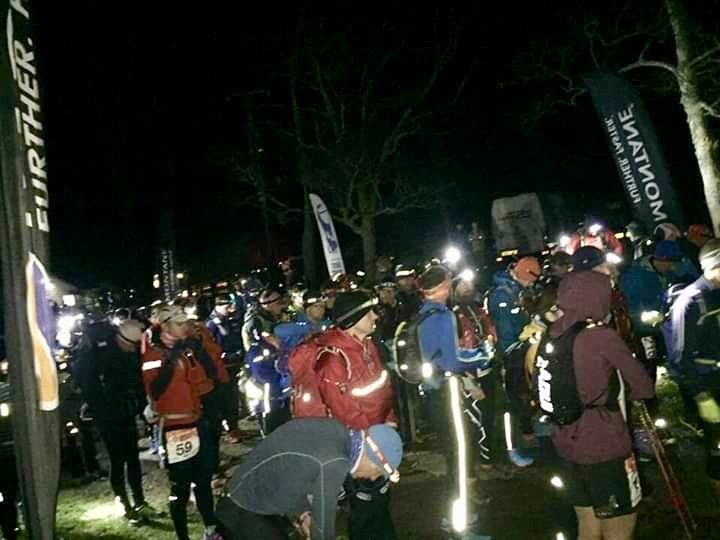 A few trips to the toilet and some fell running legend spotting (secretary of BGR club, Jasmine Paris, Kim Collinson, Carol Morgan, Tom Hollins…), then we gathered on the start line ready for 6 am. It was pitch black and frosty and who was to stand next to me but Jasmin Paris, the only one dressed in the tiniest of shorts. I chatted briefly to her about running and children before we were off and away. Stuart kept with me here, I was relieved to finally get started and to follow the tracks, loads of people and head torches lighting the way. It seemed that lots flew past as I stopped to climb a stile (and they jumped the gate). I was worried that we were already at the end of the pack. Stuart reassured me that we weren’t. ‘Look back at the top of the ridge and you’ll see all the lights’…I did and it was so pretty, a string of fairy lights stretching across the dark landscape. We soon hit a flat track and Stuart sped off; I’d thought I’d kept him in range only to realise the pack I thought was Stuart belonged to another runner. I was slightly disheartened as I enjoy his company; I thought that was the last I’d see of him until the end. It wasn’t long until the sun started to streak the sky with pink and orange. I’d been enjoying myself; I knew this section of the route. It felt wonderful to start the day running through the landscape knowing most people were wrapped up in their beds. I was looking forward to the challenge, to see if I could get myself around. I turned off my head torch as soon as I could, not long before the second checkpoint, trying to save precious battery for later. The end of the section we’d recceed came too soon; Nagshead Knowe is where we’d cut through the forest to join the second half on our recce. Strange to think how long it would take to reach the Border Ridge when now it was barely half a mile away. Now onto the first of the bad bogs up Bloodybush Edge. I’m sure Stuart’s ears must have been burning as I cursed him repeatedly. The fog closed in as we climbed and it was pretty unpleasant up there. Down and up to Cushat Law and I spotted a ponytail. 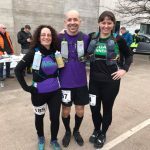 I wondered if this belonged to a man or a woman only to realise it was Carol Morgan (winner of the Spine) along with Shelli Gordon (I reckoned these must be 2nd and 3rd ladies) and low and behold my mate, Stuart! I tagged onto the group and kept with them for quite some time. It was pretty tough underfoot, either bogs or thick heather without much of a trod anywhere. We soon dropped down out of the mist and you could see for miles over the rolling fells. The tracks became grassier and easier going. I’d tucked myself nicely into a pack and had 2nd and 3rd ladies in clear sight. I started chatting to another runner, he’d marshalled at the DT series and had run the tour last year, we kept together for quite some time. 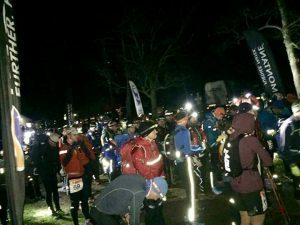 This ultra running was quite sociable! There was a lovely descent down Copper Snout, although the huge black cows made me nervous, especially as we’d been warned that there were mad cows en route that liked to chase people! The descent then changed to a steep grassy ascent onto Shillhope Law. 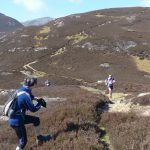 I was running by myself here, navigating was not a problem and soon I was dropping down to the food checkpoint at Barrowburn. A lovely little stone house welcomed us with a roaring fire, ladies handed us tea and soup and our bags were waiting ready for a quick change and top up of supplies. I’d briefly chatted to Stuart, Shelli and Carol but they’d left perhaps 10 minutes before me. I changed my top half as quickly as possible, talc-ed my feet (and left behind a great pile of talc dust) and changed my trainers. Then, tea in hand, I started out of the door. I knew about 3-4 miles of tarmac lay ahead. It wound around the River Coquet. There were a few signs on the other side ‘warning danger of death’, ‘do not touch bomb shrapnel it may explode and kill you!’ I kept passing two pairs of runners; they seemed to be supporting each other. Everyone’s thoughts were the same. The hard track reverberated through our bodies; it was tough and boring. Finally, we headed up to Deel’s Hill. I’d been quite happy navigating around the road. There was absolutely no chance of losing the way, but at the ridgeline, the fog descended and the paths crisscrossed everywhere. I stopped briefly, pretending to get something out of my bag, but really to sidle myself between the two pairs of runners. I wanted to make sure I didn’t go off track and I didn’t want to use up precious GPS battery power until I really needed it. This did mean my pace slowed. Finally, I hit the start of the Pennine Way. Happy now that I was on target, I stopped the pair in front just to check with them where I thought I was on the map was actually where I was. In agreement with me, I picked up my speed only to realise one of the pair had been doing exactly the same. He then kept with me, pretty much, all the way to the end. He’d been relying on his GPS, which had failed miserably, so now we were both maps in hand urging each other on. His company was appreciated; he’d started singing and whistling, which in the midst of now sideways rain and really cold biting wind was extremely comforting. At Lamb Hill Stuart had left a message with the Marshall… ‘I’m sorry’. I’d asked how much ahead he was, ‘Oh not far. 10 minutes at the most.’ I genuinely thought he was underestimating it to cheer me up. On up to Windy Gyle and the freezing wind, horrible rain and bog underfoot were really taking its toll. It slowed my pace, which again made me colder. I planned to stop with the marshals, top up my water but more importantly, add on some layers and put my better gloves and hat on. Honestly, I should have stopped before, as, by the time I stopped and switched, even though the marshal had helped as my fingers were now ice cold, I was really feeling cold and was concerned. As soon as I got moving again I made a concerted effort to pick up my pace and warm myself up. At just the right time, when I was feeling pretty low, through the mist, two men appeared. I was surprised to be greeted by Kevin (Geoff’s friend, who I’d met on JNC recces). It’s funny how these brief meetings can boost your mood. I continued to push on; worried if I’d slow again I’d really suffer. Thankfully the wind dropped and with the solid paving on this section, my pace increased. The light started to fade on up to the Cheviot. I knew I wanted to stay without my head torch as long as possible to preserve batteries but I also wanted to get them out before I couldn’t see at all. I bargained with myself that I’d stop at the next checkpoint with the marshals. They came sooner than expected. I stopped and they helped light up my bag. They laughed as I donned my head torch, stuck an extra battery pack in my pocket and then got out my spare head torch. ‘How long are you planning to be out…you’ve only got 11 miles left, you’re on the home straight, you won’t need all of those’. I’d told them my nightmares of Hedgehope bog in darkness and they continued giggling as I set off towards the summit. I kept the torch off, as when it was on, the light bounced off the fog and I couldn’t see a thing. I could actually see the stones better in the fading light. A few runners passed me on the out and back, then I saw a light, turned my head to the side so I wasn’t blinded only to hear Stuart’s voice, ‘Elaine?! You legend! Hurry up, the summit’s just there, catch me up and we can do the last bit together!’ I can’t tell you how much that cheered me up, but the summit seemed a long way off. By the time I got back to the descent, I thought he’d be long gone. I turned on my head torch, now unable to see a thing. However, I was totally disorientated, visibility was so poor; it was at most a few meters. I headed straight for the fence line and was feeling quite scared. I knew the route, I knew I could use the fence as a handrail for the next 4 to 5 miles but I really couldn’t see a thing beyond my feet. Thankfully my companion had waited for me. He knew I’d recceed this section and he had waited to finish it with me. We made pretty slow progress then hit the bottom. Overexcited, he’d followed another runner who had shot off in the wrong direction towards Langleeford. I’d shouted after him to go back to the fence and thankfully he’d turned back and had kindly stopped again near the horrendous peat hags to help me up the incredibly muddy banks. 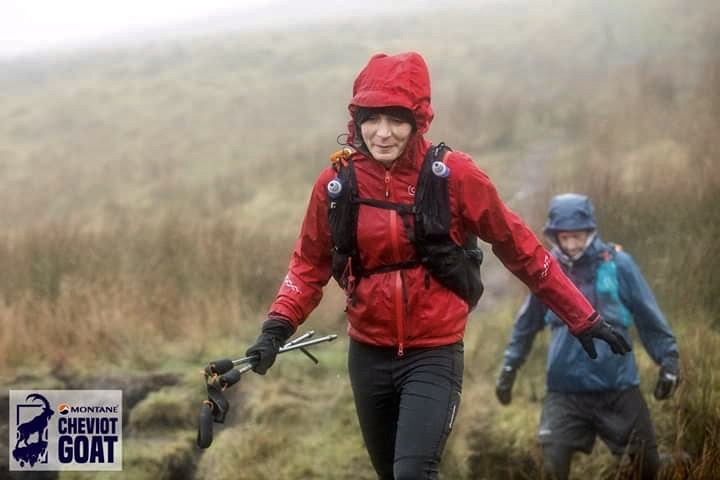 I can’t tell you enough how wonderful the gesture of someone holding out their hand to haul you out of the bogs feels! That was just the thing I needed, my heart lifted and I knew I could finish safely. The bogs were so saturated I sunk past my knees, far too many times and it was really had to pull against the suction to retrieve my legs again. And so we three became four as another man joined us. We started chatting again and I started feasting on mint cake. Both eased the journey. We even managed to find the lovely bouncy mesh path that we’d stumbled across on one of our recces, saving our legs from the bogs for at least 100m! Reaching the top of Hedgehope the marshals said the 3rd lady wasn’t far off. I’d really thought they were kidding, a nice way to encourage me. Descending again we almost went off course…there’s a bit of bog that you naturally head to the right to avoid and if you’re not concentrating you end up heading down the wrong fence line instead of climbing over the stile. We did this on a recce, not far, but enough for us to know immediately our error. Two lights ahead told us that someone had done just that (from the dot watchers I think it was Shelli). I struggled on the descent, the mist was making visibility really poor and our lights just reflected back on us. We were pretty confident of the route until the crags, trudging through wet and slippy mud and bogs. On up to the final checkpoint and someone stuck their head out of the tent to welcome us by. Stuart was convinced by now that Shelli was close; he thought we’d passed the man she’d been running with. Anyway, we had more pressing concerns, getting us safely across the last moorland home. At the crags we’d agreed we would head for the sheepfold then the fence, taking bearings and using our map and compass only. The fence led us straight to the house at Reavelyhill and from there it was easy going. However, between the now 6 of us, we had 3 working GPS units all directing us the same way…odds that all 3 would fail were low so we settled in with this group and slowly we crossed the last moor, on to Reavelyhill. 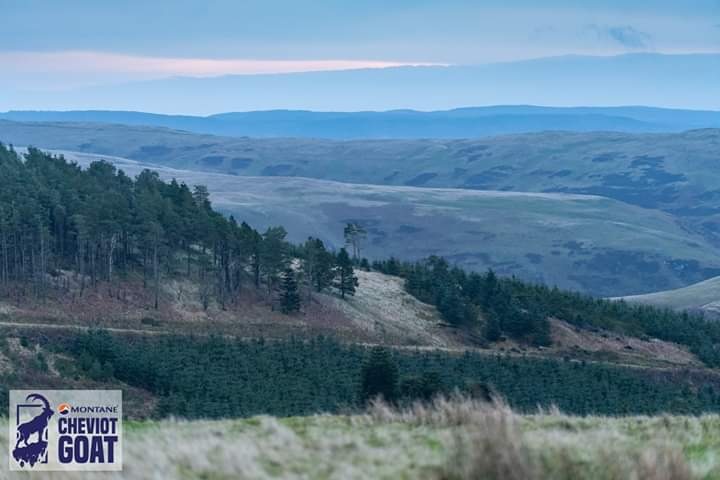 From the house, it’s an easy run across a grassy path through a gate and up over a stile, across a few farmers fields and onto the road back to Ingram. Now we were 4 again, urging each other on. I struggled on the road, I’d really had enough but soon there were finish signs. We had to wind back on ourselves and this switch back annoyed me. Stuart was giddy with excitement though and he kept shouting at me to hurry up. He slowed and said, ‘Right let’s get this exactly right so that we cross the finish line together’. We had our group photo taken, Stuart who had got me into all this boggy madness, Paul who had virtually accompanied me on the final half and another Paul who had joined us at Hedgehope. It really is wonderful the camaraderie and support from strangers that you receive in these races. 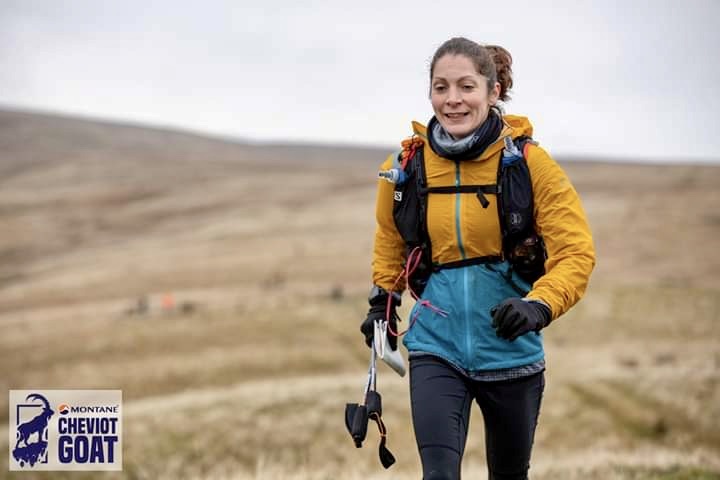 I’m proud to have finished 4th; the top three ladies are pretty talented (Jasmin Paris, Carol Morgan and Shelli Gordon). Into the cafe and a chair was pulled out for me, hot soup and buttered bread brought over. As I happily tucked in Stuart had headed off to another part of the cafe. It was reasonably busy so I thought he’d just sneaked in on another table. After filling my belly I thought I best find him, as he was my taxi home. Now I won’t divulge the entire story, as I wasn’t party to it, suffice to say I would have been giggling endlessly. I was to find Stuart wrapped in a mountain rescue jacket, a girls scarf, and a blanket with hot water bottles on his feet and hands. His clothes and contents of his bag were strewn all over the place. I do believe from his tale that some of the runners enjoyed quite an unexpected sight amidst their soup and bread! Relieved he was well, we had a few cups of tea and lemonade and we were off home, phoning our spouses to let them know we were in fact still alive and well and would bless them with our company shortly. So The Goat, it certainly lived up to expectations and that buzz I was missing has certainly returned. Someone said, in the middle of the run, about the law of diminishing returns and how the input becomes ever greater…I believe I may have just started on this path. I am also wondering whether it would be wise to block Stuart from all future correspondence, otherwise, I’ll be on the start line of the Barkley Marathons before too long! In all seriousness though, it is a well-organised and planned event. 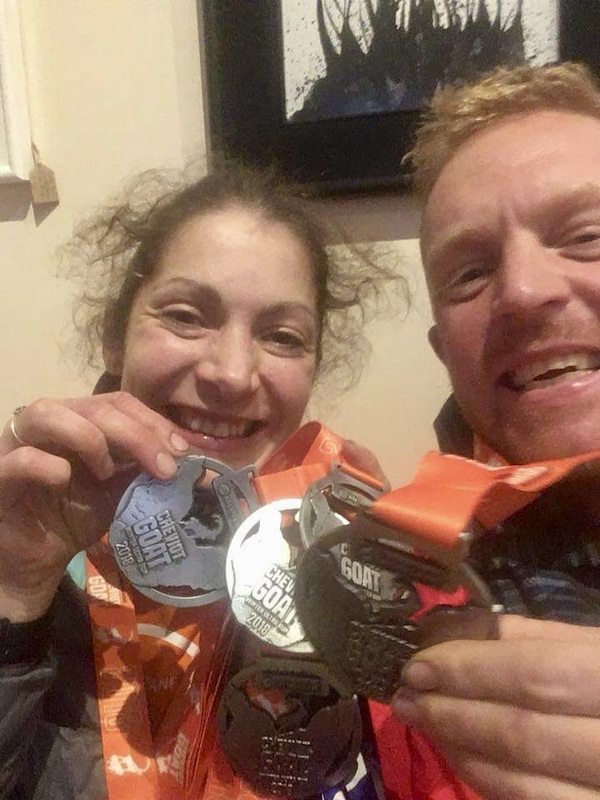 However, it should not be attempted as a first ultra and certainly not without good experience on mountains in all weather and self-sufficiency in these wild places. I’d also advise recce-ing the route. A GPS is good as a backup but can’t be relied upon solely. If you did go off track (it is not waymarked until the last 100m) and then got injured, it could be a long time until you were found. I finished in 13hrs 43 minutes and was relieved to be away from the elements. Some of the runners were out for the full 24 hours! To be out in those conditions, and I know it could have been a lot worse, would not be fun. So … enter with caution.